Time sort of slipped away from me and I didn’t quite realize how long it had been since my last post, oops! I’ve been busy with projects throughout the past few weeks. My primary focus has been Elsa but I’ve also been working on a bunch of mock ups and original designs, some of which are historical based and others that are somewhat casual. I don’t think a day has gone by that I haven’t worked on something for at least an hour – it’s been great. Most of my precious hours of productivity have been eaten by Elsa. This costume has been such a huge undertaking, even more challenging and time consuming then I had originally expected! But I’ve really enjoyed the opportunity to make something really detailed. It’s always been a dream of mine. So that’s what I’m going to talk about today. I originally planned on only having three posts about the making of Elsa, but I’ve given up on that and will be happy if I end up with five. I have tons of photos and information to share about this, and I don’t want to scrunch it down. You can read my previous posts about this project, here and here. For Elsa’s shirt and cape (or as some people have been calling it, her train) I chose to use stretch mesh. 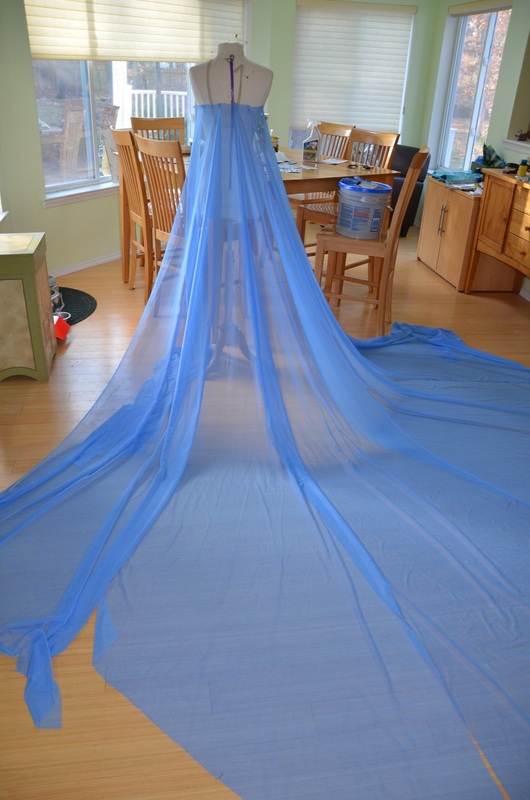 It’s a material that looks like tulle, but feels much softer and stretches in all directions. Sadly it doesn’t drape as nicely as chiffon or organza, but since it’s stretchy it will work better for the shirt. I won’t even have to worry about adding a zipper, or hemming anything since it doesn’t fray! 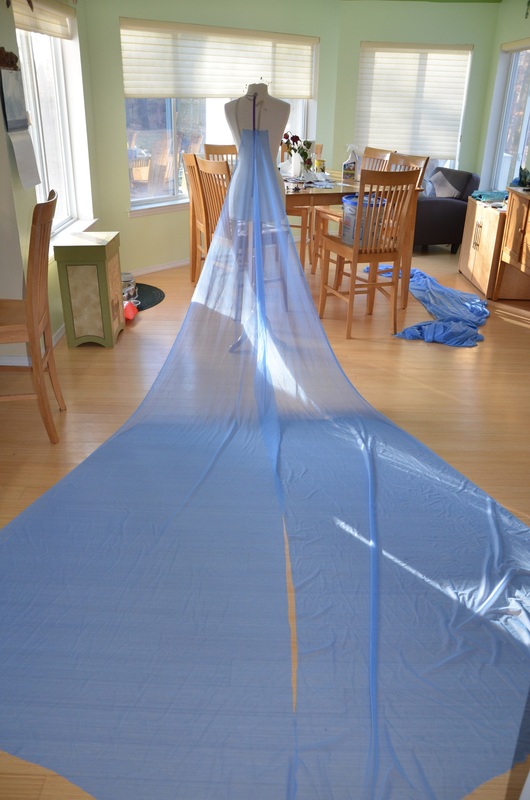 I purchased eleven yards of stretch mesh, one yard for the bodice, and ten yards for the cape. I cut the ten yards into three chunks, two that were three yards long and one that was four yards long. Then I pinned them very roughly onto my dress form to make sure I had enough length. It doesn’t look like much, but I was actually really happy with it haha. I had plenty of length, and I could tell I had enough fabric for the volume I wanted as well. I knew I wanted my cape to be six panels, with a seam down the back. 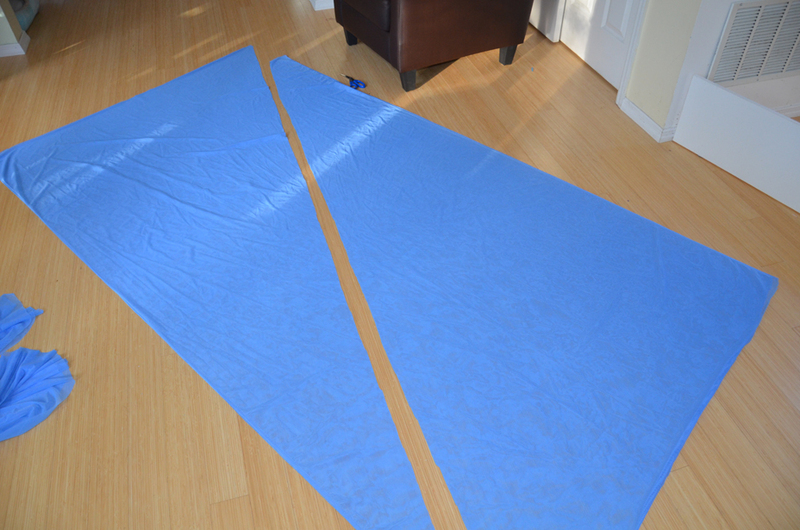 So my next task was cutting each length of fabric in half, so they could create two panels. Instead of cutting them in half the way you would expect, I cut them diagonally so I could save the length. 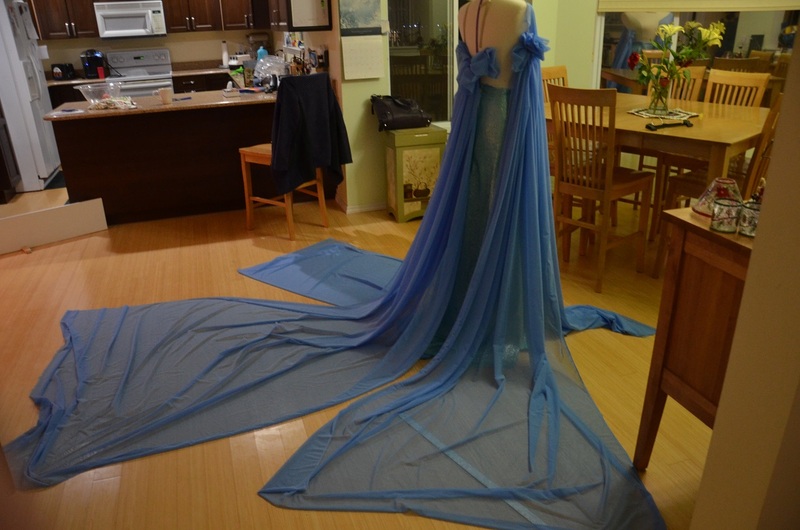 Then I pinned the longest panels onto my dress form. I made sure to adjust my dress form so it stands at my height, plus a few inches to account for the heels that go with this costume. Now I was ready to start shaping it! I pinned all the panels together and trimmed one side down until I liked the shape. Then I took it off my dress form and used the side I had trimmed as a pattern for the other half. In the end, it looked like this. The whole thing got sewn together, and then I was ready to start figuring out the snowflake pattern! I must admit that I took some artistic liberties here. 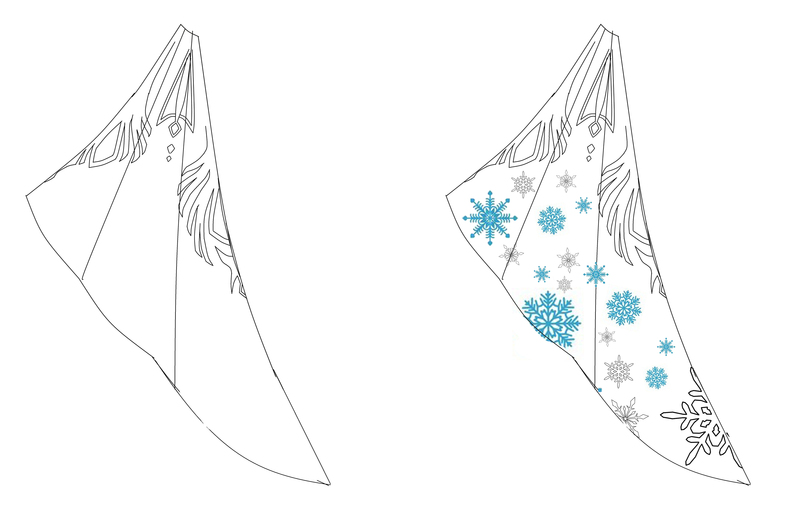 I really loved how the cape looked in the movie, but when I began sketching out the snowflake pattern in real life, I realized if I made it accurate, the pattern would be very blocky. And I don’t think of Elsa as a blocky character. She’s all smooth and shiny and sleek. So, for obvious reasons, I wanted it to look smooth and shiny and sleek. I tried to keep the shape of the snowflakes similar to the way they are shown in the movie, but softer and with more detail. 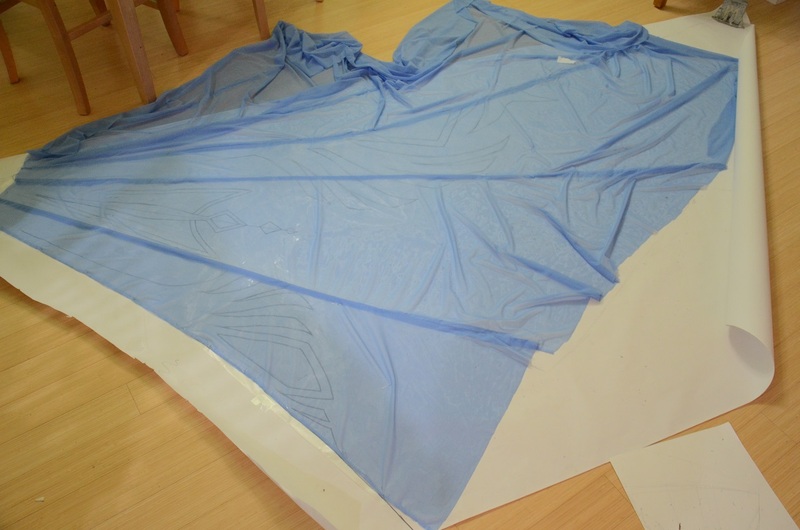 I laid the cape flat on a giant sheet of paper, then traced around it and marked out all the seams. 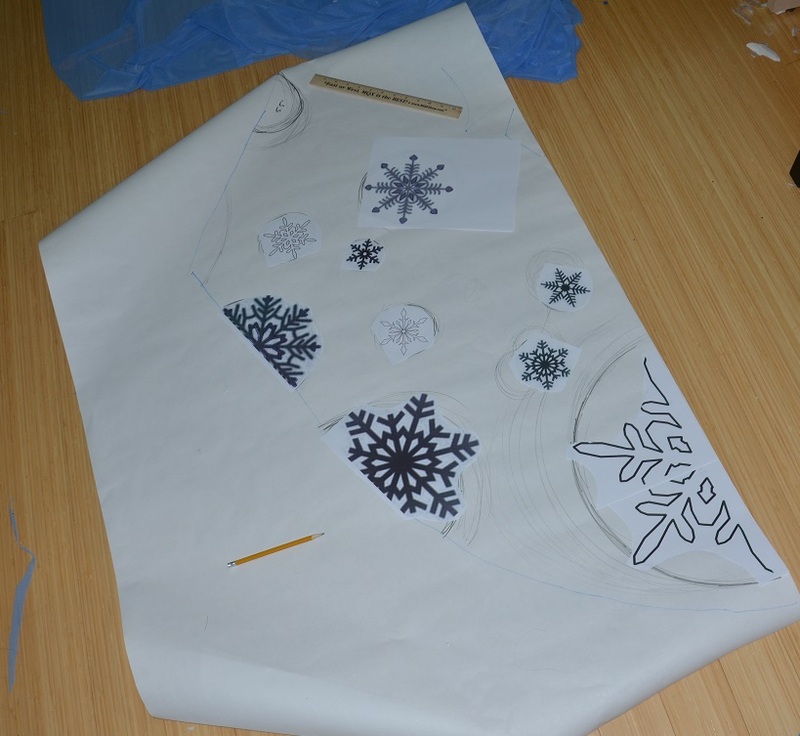 I used a ruler and french curves to draw out the giant snowflake. Once I was finished, I taped wax paper over the entire design, and pinned the cape over top of it. Since the fabric is sheer, the design is easy to see through the cape. This way I have a guide for embellishments. Now moving on to getting the smaller snowflakes onto the cape! 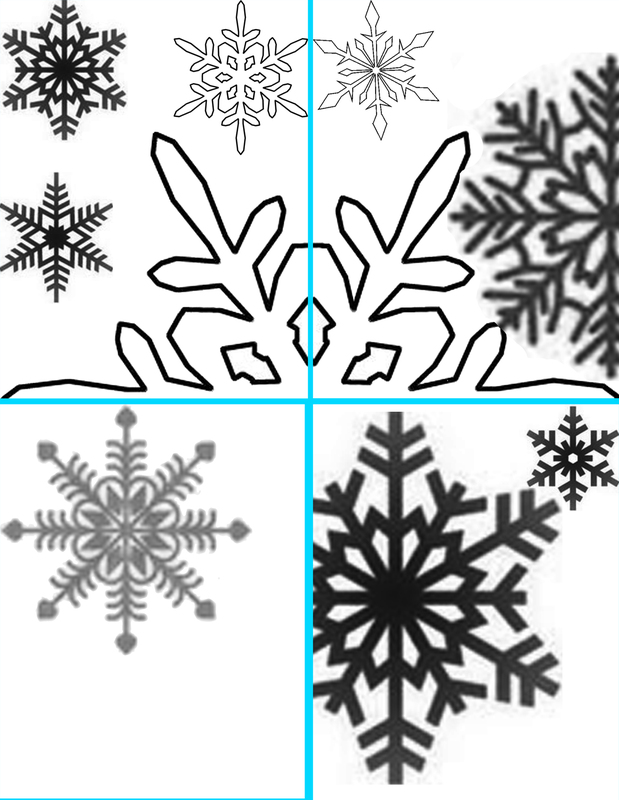 I started by going into photoshop and figuring out (roughly) where the snowflakes should go, and what size they should be. I decided to conquer these panel by panel so I wouldn’t get to overwhelmed – right now I’ve just started, so I only have one panel complete. Luckily that’s enough to make an example out of. 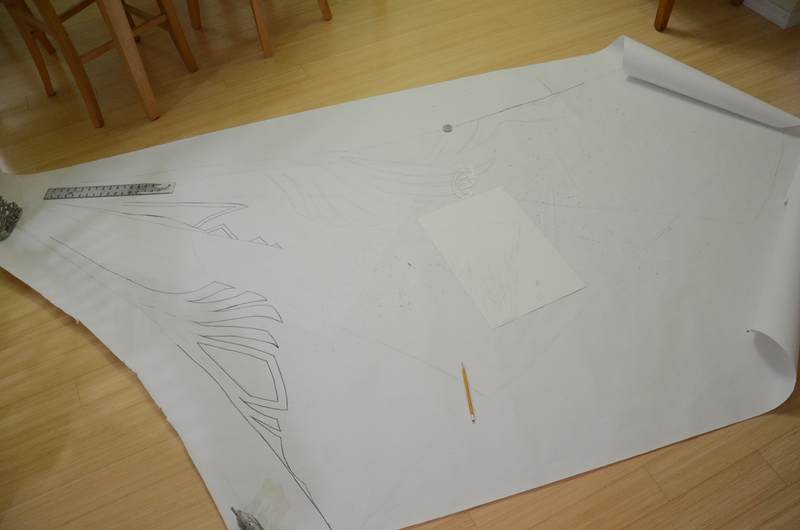 I laid my cape piece over paper and traced out the area I needed to add snowflakes to. 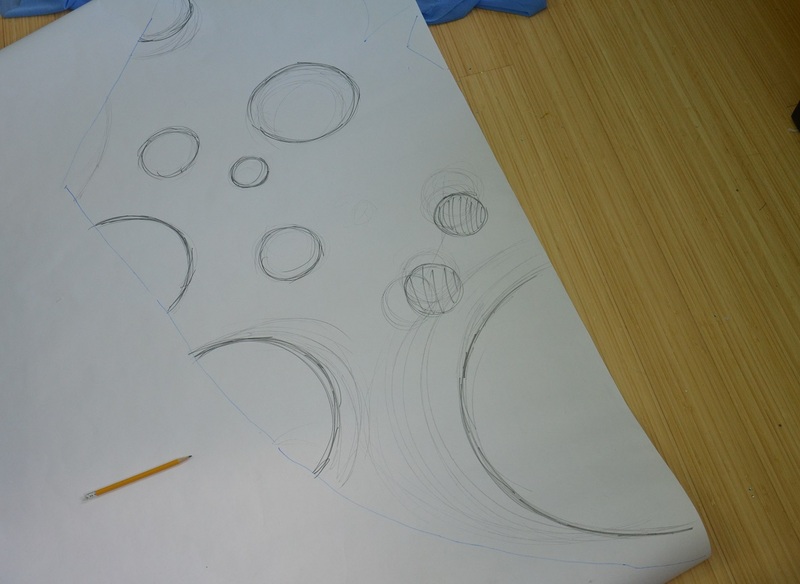 Then I used my guide to draw out circles in the rough areas where snowflakes needed to go. I measured the size of each circle and marked them clearly. 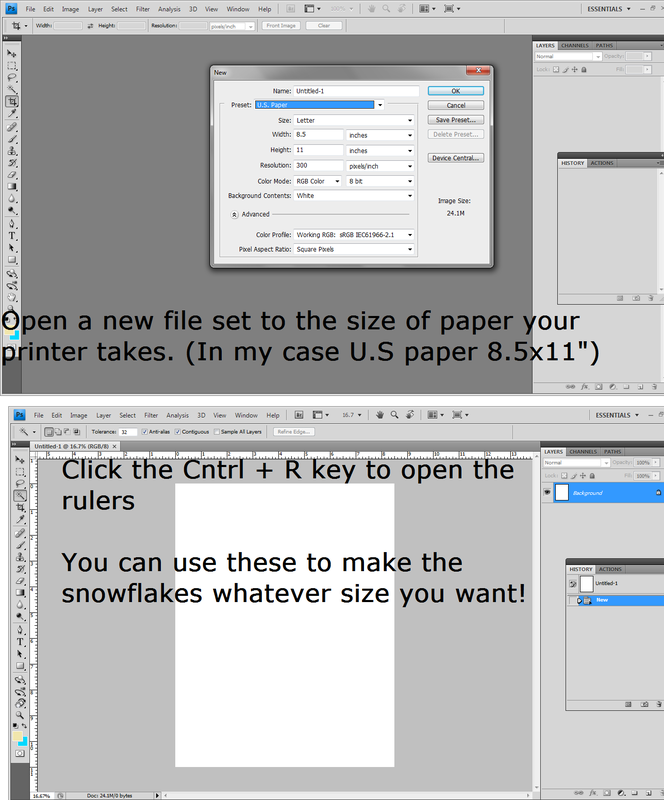 Now I knew exactly what size of snowflake patterns I needed to print. I ended up needed to print off four pieces of paper for this particular panel. Then I cut them out and taped them into the right places. I ran out of wax paper, so I improvised and used a layer of plastic wrap taped over the designs. But I will save all the information about how to do THAT for next week. Such amazing work on that cape! It looks so good! I can’t believe you were able to make the shape so perfectly in real life! You are freaking amazing. I am really enjoying following your progress. I just saw the movie and I am chomping at the bit to make costumes! You have mad sewing skills and a ton of talent.. and so young!! I AM inspired, thank you! Very awesome!! How are you attaching the sequins/rhinestones? Glue? Looking forward to seeing it all put together. Love you work. Awesome! You are soooo cool! Are you really sixteen? Girl, I’m envying your talent SO MUCH (in a good way)!! So inspiring work!!! I ordered blue glittery fabric just before I saw your post. I’m making one for my daughter (4 1/2) to attach to a Disney Elsa costume. She walks around the house singing Let it Go with a long blanket wrapped around her neck to imitate this cape. Thank you for your blog. You are giving me great inspiration. 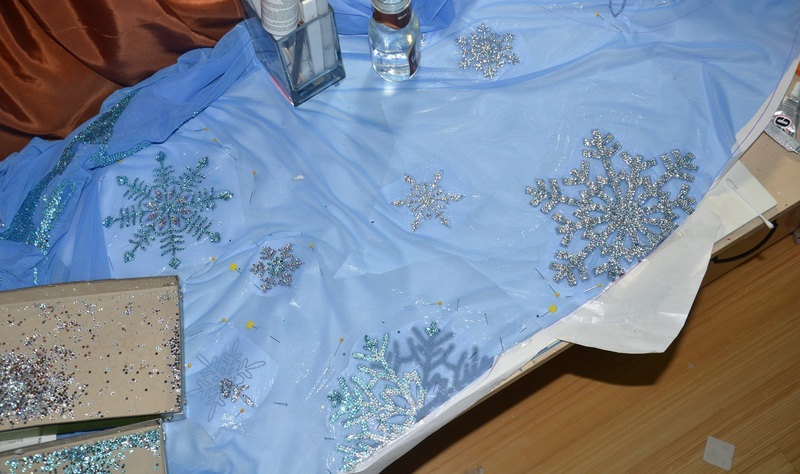 I was going to use fabric glitter paint for the snowflakes but I LOVE the rhinestones. 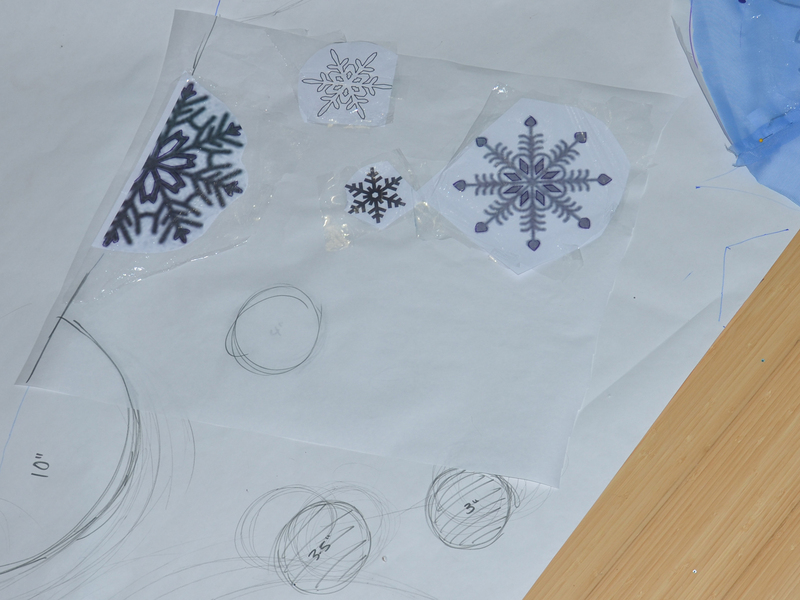 I think the one in the movie is a bit more jagged at the edges…the snowflakes go right to the edge. Can’t wait to get started. I’ll keep checking back to see the finished product. We are obsessed with this movie cant wait to see it on Broadway. Why did you put down wax paper before you did embellishments? Is it so the cape doesn’t adhere to the paper? I’ll go into more detail in the next post, but yeah, pretty much. The glue will also disolve the ink on the paper, ruining the design and getting black ink on the cape. Can I something crazy? You are a psycho… but an amazing psycho! Love the work!!! Great inspirations, by the way I’m making one for my 7 y.o.cos we had to return Disney dress as it is irritating her skin. Where are you? Post more! We miss you! Looking forward to more Elsa details!! I love your attention to detail, admire your beautiful finish work as well. My granddaughter has ask me to make her a Elsa gown for her 5th birthday, hoping I can scale down from your beautiful figure of a dress to a wee size!! That’s awesome! I am looking for a Elsa dress and I just can’t find one in time for my cousin’s 8’th Bday. It is Frozen themed and on Feb. 9 but I don’t think I can do all this work! Can you help? Hi, can you pleasemake a tutorial how to do Anna´s dress? I mean those with blue skirt… I wanna cosplay her, but i rlly have no idea how to sew it 😦 Thank you! OMG I love you. You are insanely talented at such a relatively young age. This tutorial was a ton of fun to follow and now I can’t resist the urge to make one myself. Thank you for sharing this with us. God bless. Angela, could you possibly shed some light on where to get fabrics for the cape in particular, please? At this point I want to start with just that, then hopefully progress to the entire costume. It would be much appreciated. Thank you. I know a few websites sell it, including Spandexworld.com, though I’ve never ordered from the site before, I ordered the materials for my cape in their retail store in NYC! Good luck with the costume. 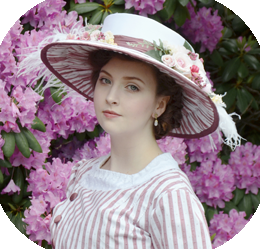 Please, for the love of God…consider a career in costuming! You have a BRIGHT future and could easily be a future Tony Award winner. Amazing work! Hey I am curious about buying the Elsa dress or paying you to make one like that with measurements. I would love to wear that at a costume party I have to go to. what kind of rhinestones do you use? no fix or hot fix and if you use the ones you have to buy the glue..what glue do you use? Wow, your cape (and entire cosplay) is incredible! I was wondering, though…how wide was the fabric that you used for the cape? It would be great if you could respond, thanks! 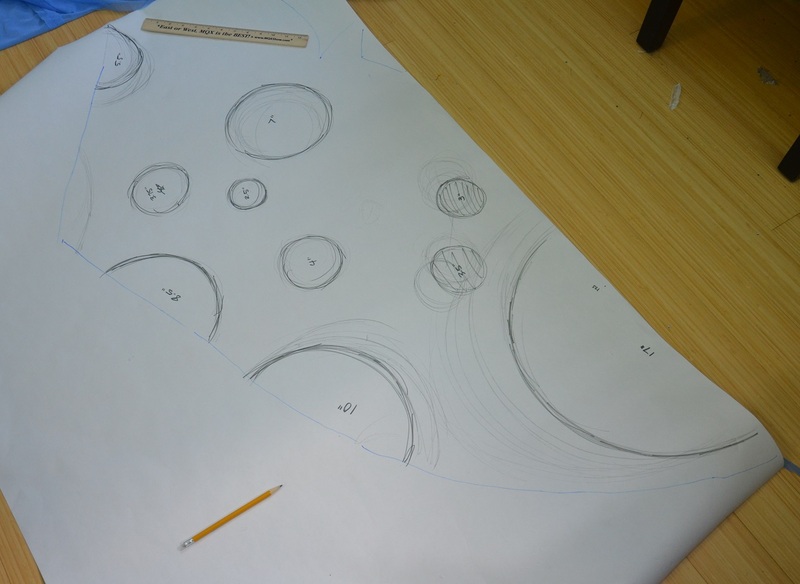 Hello, could you please briefly explain how you folded the fabric when you cut it lengthwise and what pieces you pinned together to get that shape? I’m experimenting with cutting paper lengthwise and taping it, but I can’t figure out how you got the panels pinned like that. Thank you! Great post! Curious, how on earth would you sew stretch mesh? Isn’t it kind of hard to sew since it is so sheer and stretches? You are amazing thank you for share you wonderful ideas. I’m being looking for how many yards I need for a cape you give me the idea I’m working on maleficent costume. Now I can go and buy what I need. Some one ask you so far to make a costume, how you receive offers to work with some one. Amazing very creative job. How long and how wide is your cape? 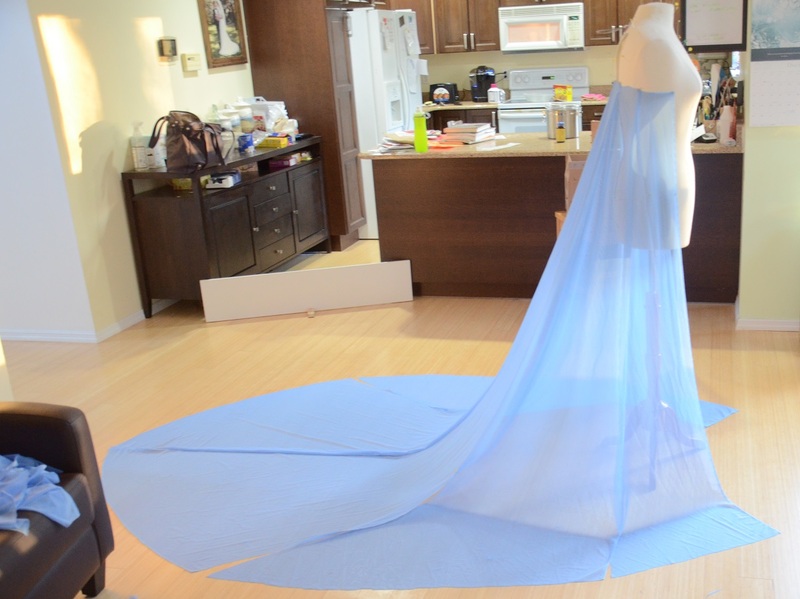 I’m working on my own version of Elsa and love the cape you created! About how long did the cape end up being? Like.. from the start to the end of the longest part on the cape? I just found this blog through Pinterest, and I am in AWE!!! This is so stunningly amazingly perfectly sleek & shiny & gorgeous! I am definitely inspired. Thank you for putting as much effort into the tutorials as you did into your costume. It’s just beyond incredible!